These beautifully crafted, custom made wedding bouquets are created using a selection of recycled vintage silk and satin fabrics, each flower is lovingly handmade by myself petal by petal in the same way as my hair flowers. please contact me if your interested in purchasing a bouquet similar to the ones pictured. I have enjoyed making these beautiful recycled vintage fabric bouquets for many years now. 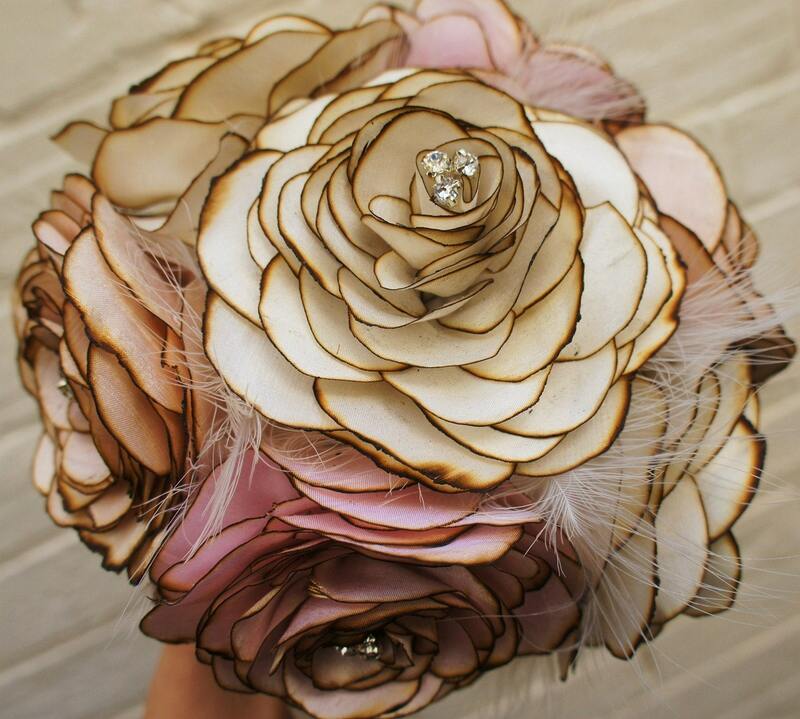 A beautiful wedding bouquet that you can keep for ever, and hand down to future generations. I have pictured a selection of bouquets in different vintage fabrics, recycled feathers, rhinestones stones, pearl beads and antique silk netting, please also look at my other flowers in my shop for inspiration. The fabric and colours may vary slightly from the pictures because all my fabric is recycled vintage fabric, so no two orders are exactly the same, I can also use antique lace ribbon to tie the bouquet together. I will work closely with you by sending photographs to make sure we make it just right for you. Each flower has been made in the same way as my hair flowers, but I have added a wire stem covered in satin ribbon to the vintage cream leather back, instead of a brooch pin or hair clip. The bouquet has simply been tied together with satin ribbon, you can also choose the colour to match. I can also make matching bridesmaid bouquets, smaller with just three flowers. Please also note that some of the the bouquets pictured have 6 flowers, but I'm now adding 7 flowers to my bouquets because I've found it looks fuller and even more special. Please get in touch so we can together create the perfect bouquet for your special day.